Reminder: My work is copyrighted. Please do not copy or repost my work without citing this as a source. 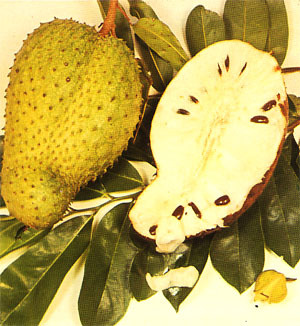 Soursop (Annona Muricata) is a plant found in Central America, the Caribbean and some parts of Sub-Saharran Africa. I've seen this plant all over Haiti during my travels and only knew it as that yummy, half-sweet/half-sour... oddly creamy massive green fruit....with black seeds. Little did I know that this popular fruit, known as corossol or kowosol in Haitian creole, and as guanabana in Spanish-speaking countries, is known for having incredible health benefits and is one of the most commonly used medicinal plants in the Caribbean. The pulp is often eaten directly from the fruit, but it can also be made into a tea or milk (or ICE CREAM) and can form a concentrate by crushing its leaves to form a powder. What makes soursop a "hot topic" fruit is that it is constantly being researched for its proclaimed anti-cancer benefits. mild sedative, diuretic, anti-hypertensive, anti-inflammatory, etc. The uses are almost endless. It's known as a"miracle fruit" in many countries in the Carribean. What a fruit! Can't wait to eat this up during my next trip to Haiti (in a few weeks)! Order a custom herbal tea blend from me by clicking here. Schedule an appointment with me at my Brooklyn office. The "Haitian Treasures" series explores the magnificent benefits and uses of Haiti's natural resources, which I call "Haitian Treasures" because they are truly national gems. Naïka in Balance is the premiere source for information on healing herbs used by Haitians. In this series, I explore the tie between Haiti's natural resources and natural, traditional, and holistic healing. Learn about other Haitian Treasures explored on this blog here! Naika, the writer of this blog, has a doctorate in Naturopathic Medicine and a Masters of Science in Acupuncture as of June 2017. Please do not take the information presented on this blog, as medical advice, without consulting your certified health care practitioner. Knowledge is power and your health is your wealth! Cool, thanks for the information Irugel! Thanks for the information. However, every medicine has a side effect or cautionary uses even if it is natural. Can you expound on that side of corossol, as well? This is hard to find in grocery stores. I live in Massachusetts and I can't find soursop (kowosol). Do you have an idea?